Hello, in this instructable I will show you how to bind your own small notebook. I know, there are tons of book binding tutorials on the internet which are often really good, but almost none of them are how real books are made. Why a small book? Well, to make a large book one requires a large industrial cutting machine to cut the large stack of paper with a clean cut. It just doesn't look good without that. And the result fits in a pocket. Have you ever noticed that pocket-sized notebooks don't really fit in a pocket? Well this one has a hard cover and it fits in a pocket so good that I didn't even notice it was there and thought I had lost it. -Something to cover your book in. I will make a book of A8 size. The size doesn't really matter but A8 is just a normal A4 sheet fold in half 4 times. Cut your A4 sheets in 8 A7 sheets and fold each A7 sheet in half. These will make the main body of the book. To make the sections, put 3 of these folded sheets in each other, later these sections will be sewn together. Do exactly the same with the nice paper, you need to make only 2 of them. These will be the cover sheets. The explanation is also visible in the pictures. Fold them NOT in the middle but a little bit more to one side so that there is a large part and a small part. The paper doesn't matter but it shoud be a littlebit stronger than normal paper, I just used the left over of the nice paper. Now, the 10 sections will be sewn onto some ribbons. Since this is a small book, I will only use 2 of them. For normal books 3 are used. Now clamp the sections between 2 boards (I used very strong cardboard). Draw with a pencil and a ruler a line at about 0.5 to 1 cm from the edges depending on the size of your book. (I did 8 mm) Locate the middle and place your ribbons about halfway between the middle and the first line you drew. Draw a line just next to the ribbon you're holding. 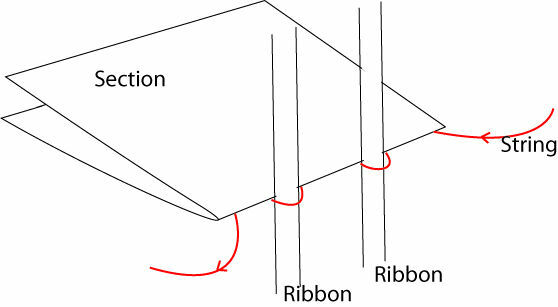 You will later sew the ribbon into place at that location. It doesn't matter very much where you place your ribbons. If it looks good, it probably is. Normally for normal books there are quite precise places where to put your ribbons but I don't remember them and lost the piece of paper where they are on. But for a book this small it doesn't even apply. Try to make it symmetrical! Because later while sewing I flipped some of the sections and they are a tiny bit out of place, but this doesn't matter. Now get a knife and gently cut along the 6 markings you have applied. The ones at the side and the ones next to your ribbons. Make the cuts deep enough to penetrate all 3 sheets of paper. This will create the holes trough which you will guide the string whilst sewing. get the sections out of the clamp. Get the sections out of the clamps. So, get a needle and poke trough the holes of the section you have already made. This is to make them bigger so the sewing is easyer and if your knife didn't go all the way trough, you can complete the holes. Use the annotations in the pictures for a more clear explanation! Also, update: I have added 3 diagrams. Now, place your first section onto the sewing bank and sew. (go in and out the holes with your wire). When you reach the end, place another section and do the same. Then the third section, when you finish that one, go under the connection between the previous sections. 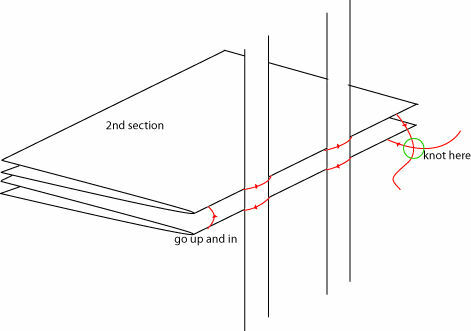 Always pull the string to tighten everything up when you reach the end of a section! Then, get everything out, and trim the excess of string and ribbons. So, fold the sheet so that it is closed and apply some glue in a thin area 2-4 mm from the fold. It's easy to use an other sheet of paper to cover most of the nice sheet up and leave a small stroke open at the fold. Add the other sheet to the other side. Then, gather the ears you have made and apply glue on the biggest flap but do not completely cover it with glue. There must be a stroke without glue . Later you will have to rip some of it off so you will need a hold-on (see later). Apply both ears onto the nice sheets you have just glued on. The last pictures shows the result you should have now. Now, put everything between the clamps and let the uppermost bit out . Apply lots of glue and let it dry a bit. Now adjust the book in your clamps so that the ears are just free. Then get some fine gauze, I used some from an ornamental ribbon and cut some piece about 1.5-2 cm smaller than your book. It was something metallish that is NOT GOOD, rather find some piece of fabric. (or maybe the real book binders gauze but that may be too thick) So I t didn't glue very well on the back of the book and I had to use other glues and became a dirty mess. But it is still good but doesn't look nice. Then find some small piece of Kraft paper a little bit smaller than the height of your book and a little wider than your piece of gauze. Apply glue on it and stick the piece of kraft paper on the gauze. Put the entire book between the clamps or place it under a press to let it dry. When the glue is dry, get the book out of the clamps and try to rip of the inner flap of the ear. You will notice that you can only rip of the part you didn't glue on. That is good! The "ripping off" makes sure that there is a slow decrease in thickness of the paper so that you won't see the ear trough the paper when your book is finished. Make it smoother with some sand paper. Step 7: Cutting of the Sides. This step normally requires a big cutting machine that can cut thick heaps of paper. If you can use one like this, DO IT! The point of this is to cut a very small sliver of each side of the pages so that the heap of paper gets a book-like appearance. I instead use a normal (max 12 sheets of paper) and had to unscrew some things in order to fit the book inside it. This was NOT good, read further to see maybe a better approach which I will try next time. surprisingly well. Next time I will try to sand the edges with a sanding machine instead of trying to cut them. There are indeed lots of brims at the edges but they are easily removable. You can also notice that the outermost pages have bent over edges from the sanding, but placing it between the clamps again for a few minutes fixes that. Now measure up your your book. Cut out rectangles out of fairly thin pressed cardboard (mine 1mm thick) . Place the cover at the line you just made but watch out for parallax, I misplaced my cardboard almost 1 mm from the edge and you can clearly see that it is not good in the final result. Finally rip of the extra unglued piece of flap of the ears to again get a nice transition between paper and no paper. Well, normally I continued without this step (because I forgot) but then I messed up and had to restart from step 8 so you will see both green and red cover wrapping. The green one failed because it was too thick. The headband is the piece of fabric you pull on when you pull a book out of a shelf. Often it is a bright colour. The normal stuff is just too thick to use in this small book so I will make some myself. Usually you can't do wrong by using the stuff you are wrapping your book in but you can choose anything you want. So, cut 2 small pieces of your cover wrapping to make the headband. Use a small piece of string (I used the a left over from the sewing) and place it in the middle of your piece of wrapping. Add glue and fold it in half with the string in the fold so that it bulges a bit. Apply force so that the bulge is larger at one side than the other. Find a piece of thin cardboard. I used a piece of a "granny" box or a cereal box will be the same. But try to find something stronger than that but not much thicker! 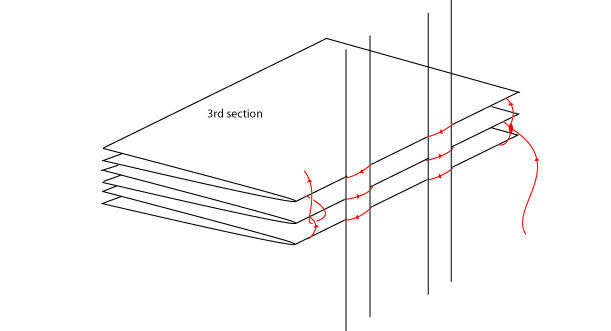 Cut the piece of cardboard to a rectangle with the same hight of your pieces of cardboard and with a width equal to the with of your book with the covers. Try to do that width as exact as possible. Then, find some kraft paper and cut out a piece with hight smaller than your book and width a lot more than the width of your back. Apply glue on the kraft-paper and put your card board back onto it, then stick all of it onto the book. As you can see, the back is not glued directly to the book. And I am absolutely terrible in it. In large books it is fairly doable but in small books it is quite hard. Look at the pictures the dirt is caused by semi-dried-up glue from retrying and retrying. Since your book is small, use thin cover wrapping (so not thick leather or something like that) I used something I thought was thin but it was not and I screwed up. Secondly, use BAD GLUE glue that dries very slow and doesn't stick very hard so that you can redo things several times. I made my bookbinders glue bad by adding a lot of water (but it still dried too fast) maybe use some "pritt stick" or something like that. With my watery glue, cardboard back and covers got a bit wet and they deformed a bit sadly enough. Then, cut some piece of your cover wrapping about the size of your book and a littlebit more (about the size of your slits more). Apply the bad glue on the entire piece of wrapping and the outside of your book and wrap it around the covers of your book. Use 2 toothpicks to press the wrapping inside. Then, cut the corners of your sheet of wrapping but beware! Don't cut of too much because it will look really bad! Instead use a piece of cardboard of the same thickness as your covers and mark a line with that piece of cardboard one thickness away from the corner of your cover. Then cut off the corners. Press down the covers and pull up the papers of your book to spread open the slits you have made, fold the wrapping on the the edge of your cardboard back into the slits. this is quite strange and difficult. But look at the pictures. Use a pencil or a stick to press it in as deep as you can. Do the same for both top and bottom. Watch out that you don't peel of your headbands! Then fold over the piece of wrapping at the ends of your cover but watch out at the ends! It is easier to first press up on the wrapping at the corner and then gently pull the rest of the wrapping over it. I know this is explained a bit strange but it is quite intuitive when you do it. The point is that it has to look nice (sort of nice in my case). Then press the toothpicks in the joints between the covers and the back and put it in a press or in my case stack a lot of weight on it. Also place some papers between the covers and the rest of your book first so that the pages aren't glued to the covers. Now, I don't have many pictures of this but you need your cover paper glued onto the your cover. First of all trim the excess wrapping that you have fold over your cover by giving it a cut and peeling it off. Make it so that when you fold over the cover paper, it just gets over your wrapping and you don't see any naked cardboard. Then, apply some glue to the cover and fold over your cover paper. Put some paper between the cover papers and apply some weight again. The result is a small book. I am not quite happy with the result, things got a bit messy. Also, the cutting technique from Step 7 should be better, even with the sanding the block of paper was a bit skew so, adding the straight covers resulted in skew looking covers. I will redo this book another time in the coming months. So, what do you think of my first instructable? This is a wonderful Instructable. I just made one book in the past 3 days and I have another in the process. Its really amazing to see how books are really made and be able to do it yourself. I'm also amazed how common and around-the-house the materials can be. Thanks, i could never have done it without this demo! Actually at the moment I'm working on a bigger, more practical book for a new instructable that will be more detailed and with better pictures. The book is almost finished, but the instructable will take some time. One of the best instructables I've seen! Great! Now if I can only find a way to print a book that small.. Love the instructables will try it. The material is called 'Book cloth', but you can use whatever you want for it. And if you want another colour along the spine, you can do it in exactly the same way. But with a smaller piece only for the spine (and a small part of the covers). And then you can add cloth with an other colour for the rest of the covers. But you must look out for difference in thickness of the materials. pretty good 'ible dude...may I suggest you look on youtube for a girl who goes by Sea Lemon? she has great tutorials on hand binding books and maybe you could tinker around with your design using some of her techniques. her video on binding the text block (follow this link https://www.youtube.com/watch?v=XGQ5P8QVHSg&feature=c4-overview-vl&list=PL2F704E01F80BA1E9) and her tutorial on making the case binding for the text block (follow this link https://www.youtube.com/watch?v=Av_rU-yOPd4&list=PL2F704E01F80BA1E9) are really great and I made a text block with little complication. just a though. not trying to stomp on your parade here. but nonetheless great job on your first ible!!! Thanks! That's an amazing youtube channel. And yes, my instructable uses a different technique. It is the technique I learned some time ago. I have been wanting to redo this instructable for a larger book in a more serious and clear way with better photos. (Larger books are way less clumsy/messy) But I just don't get to it. What material did you use for the book cover? I can't tell from the pictures. Hello, in English it is called book cloth. (It feels like linen on the outside). But you can use whatever you like. J'ai tout bien compris à part le moment avec le papier de verre à la phase 6 (step 6). Le papier de verre est utilisé pour 'aplanir' les côtés du livre. Normalement on utillise une grande machine à couper pour coupér une petite tranche des côtés. Mais je n'avais pas accès à une machine comme ça. Donc j'ai essayé à utiliser papier de verre et ça marchait bon. This was a great instructable, it turned a boring day into a project day!! !